I have a little St. Patrick’s Day Freebie to share with you. One of my son’s most fond memories from his 1st grade year was searching for leprechauns out on the playground. I love that something so simple can leave such a fantastic impression. I enjoy doing this “nothing but fun” activity with my students each year. It’s always been a St. Patrick’s Day time activity that we’ve done in first grade. The kiddos always love it. Simply searching for clues that those itty-bitty lucky little guys might be hiding somewhere just gives them such a thrill. First of all, we let all of the first graders work together in this little activity. 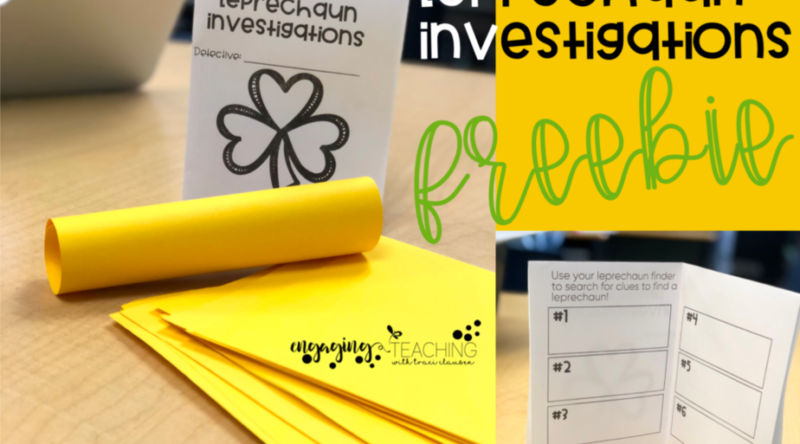 They quickly enact a divide and conquer plan and group up in various areas around the field and playground areas holding pencil and note taking sheets booklet in one hand and their “investigator scope” in the other. Secondly, this is just SUPER simple. Print and fold the paper. Then roll an “investigator scope”. For that, just give the kiddos a square piece of construction to decorate. Then, roll it up and fasten it closed with a piece of tape. Optionally, you can punch a hole to thread a piece of yarn through to make a lanyard. Easy-Peasy! Sometimes those “just because it is fun” activities are the absolute best! Want some more March and St. Patrick’s Day fun? Check out the March Resource Round Up for all kinds of goodies including another FREEBIE!